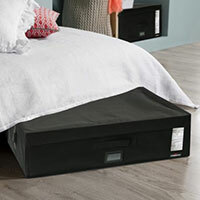 Low profile under bed storage chest with zip fastening. Keep the whole family organised with our 2019 family calendar which has space for up to 5 peoples activities plus a handy storage pocket for invitations, appointment cards etc. 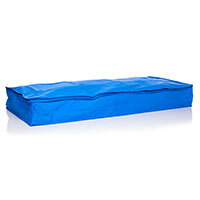 A low profile but BIG 180-litre capacity vacuum storage bag integrated into a handy rectangular box for easy storage. Holds the equivalent of 2 king size duvets. 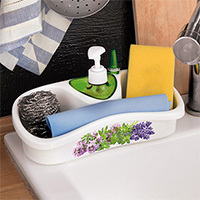 Sink side organiser with soap dispenser, space to store scourers, rubber gloves etc and a handy ring holder. 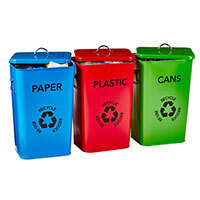 Set of 3 colourful metal recycle bins to keep your kitchen/utility room tidy. Each bin has a 26 litre capacity. Loop your scarves and pashminas though the 16 rings to create a multi-coloured skirt for the boho dress scarf organiser. A handy item to have around when cleansing and toning. 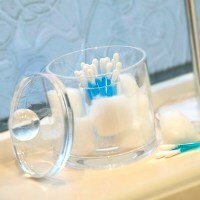 Our clear acrylic cotton bud and ball holder is a must have item for any bathroom. 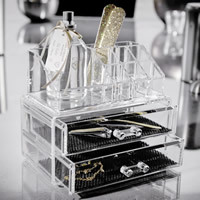 Organise your jewellery, cosmetics, hair grips etc with this crystal clear acrylic organiser. Looks equally great in the bathroom or on a dressing table. SAVE 70% OFF REGULAR PRICE! 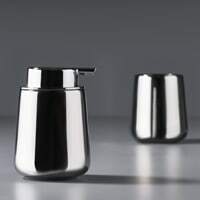 Top quality designer soap dispenser and toothbrush tumbler gift set from our friends in Denmark. Strong, durable top-quality striped garment cover. Great for coats, suits, dresses etc or out of season storage. 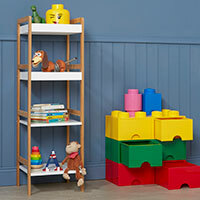 4-tier gloss white and bamboo shelving unit with a small footprint to clear toy clutter. 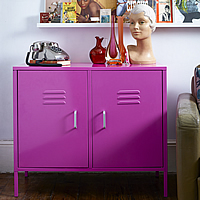 Add a splash of colour to the hallway, kitchen or kids bedroom with our new industrial looking metal cabinets. Choose from cool white, bright red, blue, green or girly pink. White shaker wooden monks bench hallway seat with bags of hidden storage within and plenty of space to hang your coats above. 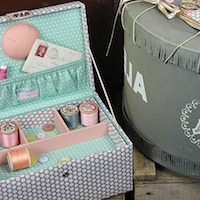 Large polka dot print sewing box with insert tray, inner pocket and pin cushion. We love this neat new wooden hallway storage idea by designer William Mak. 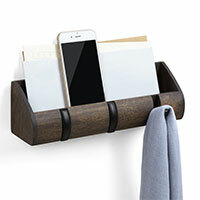 Available in a warm walnut finish, it's a great hallway organiser for post, keys, mobile phones, wallets etc. 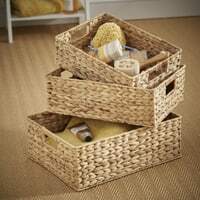 Set of three quality woven water hyacinth baskets at a great low STORE sale price. 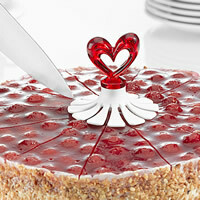 Cake slicer to give the perfect portion size every time. Neatly divides a cake into 12 equal sized portions without arguments! ALMOST 45% OFF REGULAR PRICE! 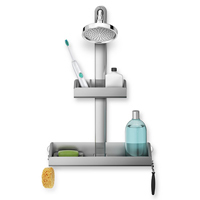 4-tier gloss white and bamboo shelving unit with a small footprint to clear bathroom clutter. 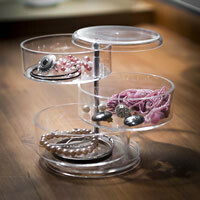 Three tier clear acrylic lidded storage tray. 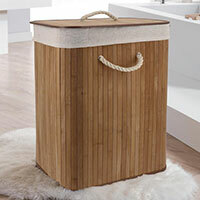 Ideal for popping on a dressing table or in the bathroom to store cosmetics, jewellery and other small items. 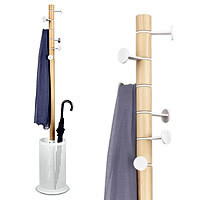 Scandi inspired coat and umbrella stand with 6 rotating storage hooks. 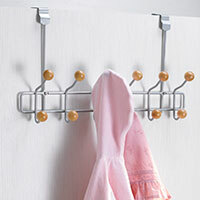 With a small footprint this well-made coat rack is great for using in the corner of a small hallway. 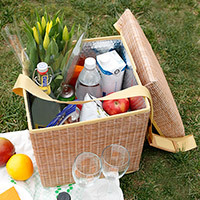 Foldable picnic hamper with carry-handle which also doubles up as a seat when you're munching your picnic. Ice white slimline storage unit with 4 open weave style drawers. Shaker style white wooden storage cabinet with drawer, great for clearing bathroom clutter. Store and organise your magazines or paperwork in our giant felt magazine bag. Also great for storing logs by the fireside, knitting or how about for toys in the kid's bedroom. 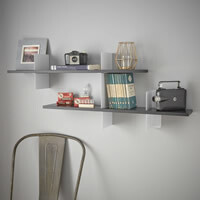 Set of 2 extendable white and black shelves. 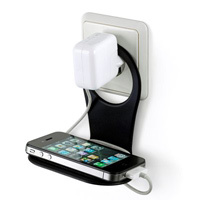 Great for using in the living room for ornaments or how about in the home office for books etc.